You’re at the ‘ukulele jam. It’s another one of those easy songs. You already know C, F, and G7 like the back of your hand. *Sigh* Can’t we play something harder? I’m sure most intermediate ‘ukulele players have had this thought at some point or another. Whether it’s your own song or one at your local kani ka pila, there is no reason to have this thought. If you need more of a challenge – find it! Don’t sit around and let the world pass you by. Here’s what I do when I find myself leaning towards playing lazy things and boredom. Force yourself to play unfamiliar inversions of all ‘ukulele chords. If you know your open chords well, limit your fingers to the frets between the 3rd and 7th – no cheating! Or move even higher to the no-mans-land of the 7th-12th frets. In a large group you’ll actually diversify the harmony and make everyone sound better! I like to think that I wrote the most complete ‘ukulele chord resource available to ‘ukulele players. Inversions are different ways to play the same exact chord. But what if you tweak the chord a bit? This creates movement inside the harmony and can create some beautiful voices you otherwise wouldn’t hear. 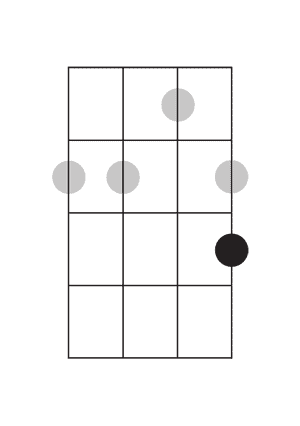 Play a C chord and you can add or remove a finger to move a chord tone to a non-chord tone. This is not rocket science so don’t be afraid to break anything. Basically, if you move a finger to a note that sounds good – do it again! If it doesn’t sound good, don’t. The main thing to keep in mind is that this is a temporary internal movement. You don’t want to do it too long. So it’s best if you move back and forth between the original chord and the movement. Also, moving more then one chord tone at a time can completely change the harmony and create clashing sounds. You don’t want to change chords, just the shade of the chord color. To be safe, only move one note at a time. If your ‘ukulele group is like most others, they “chalangalang” with a big, swinging, down/up strum (like my old kani ka pila crew here: https://www.youtube.com/watch?v=YQdxTGFRUD0). This is a great feel that allows everyone to feel good about playing rhythm; it’s fun, sounds alright with everything, and requires a low level of skill to join in on. But it’s not super exciting after a couple of the same common ‘ukulele songs you’ve already done a million times. The downstrum is on the count: 1… 2… 3… 4… and the upstrums are heavily swung later than the “and” that lives directly between the counts. A “swing” feel is just a feel that goes: long, short, long, short, etc… Basically, the turnaround from the ups to the downs is faster than from the downs to the ups. Assuming that the rest of the group is carrying the rhythm and you aren’t needed as a leader, you can break off from the generic strum. To begin the changeup you can just stop. Stop and listen. As you get better you will be able to just jump into a new rhythm part, but for starters you’ll need to assess your battle plan. Listen for possibilities and what you might want to try playing. Only play on the 1. Only play on the 2. Only play on the 3. Only play on the 4. Only play on the 1 and 3. Only play on the 2 and 4. Only play on the 2 and 3. Etc, etc, etc… With these single strums you’ll be able to hear how your playing changes the emphasis of the song even when hitting something as simple as a certain downbeat. The thing to remember is that you want to play something that fits inside the boundaries of what already exists. You don’t want to change the tempo or feel. That’s already established and doing either just means you have bad timing and are messing up the other players. What you want to do is create “push” that moves the rhythm forward in a new, alternate way. If you practice playing on certain beats long enough and continue to listen, you’ll start to realize what other fun things you could play that fit. Once you get good at playing certain downbeats on command, try working on the upbeats too. This one is kind of stupid, but if you’re a regular sitting player – stand up! It’s an important skill and the best way to learn it is to do it. If you use a strap when standing: ditch it! If you are solely a strummer, probably the hardest thing you could start doing is singing. Once you have to start thinking about operating your voice AND your uke, you won’t be bored with chalangalang anymore! I believe anybody can learn to sing. Most people who think they have a terrible voice and “shouldn’t sing” think so because they’ve never tried to sing seriously or they were told so early on, before they had a chance to improve. Think of Bob Dylan and Jimi Hendrix and Tom Petty. All super rockstars gifted with relatively horrible voices. But they learned to use them to their best ability and odds are you love the music of at least one of them. Getting better at singing really comes down to: singing a lot. The more you do it, the better you will get. If you consciously practice your vocals, you’ll hear an even faster improvement. I recommend an app called Warm Me Up. It helps warm your voice up for singing songs, but also gives you a structured way to practice on your own. I’ve found it to be very helpful in expanding my range and control. How well you can play and sing together really comes down to how well you know your song. If you can strum the chords and rhythm in your sleep, great. If you can sing the whole song in your sleep, great. You’ve got to know both to a point of almost sub-consciousness to get them to link together well. As soon as you have to think about playing and singing, you are going to mess up. So learn each part until it’s second nature and then put them together. If you still can’t, keep practicing them separately, aiming for “auto-pilot mode” where you don’t have to think about what you’re doing. So that’s 5 ways to challenge yourself when playing easy songs. Take them one at a time and focus on each for a few months. The main thing is to make it fun! Find a balance between pushing yourself and enjoyment. Without enjoyment, it’s not worth playing. If you like this article, consider sharing it with your friends or ‘ukulele club.